Those tiny clothes and pint-sized pairs of shoes are undeniably adorable, but odds are expectant parents will receive more than a few pieces to build their baby’s wee wardrobe. So, financially savvy friends and family members should consider contributing to a 529 college savings plan that will be meaningful long after a baby’s done with diapers and dolls. Assuming college prices will continue to rise at about 4 percent annually, 18 years from now, four years at the average public in-state university is projected to cost $201,386, reports SavingForCollege.com. Tuition, fees, room and board, and other costs for the average four-year private school bring the sticker price to about $398,000. A 529 college savings plan, however, allows friends and family members to make contributions toward those anticipated educational expenses so parents won’t have to struggle to foot the bill. There are two types of 529 plans: prepaid tuition plans and college savings plans. Sponsored by states, state agencies and educational institutions, 529 plans have distinct tax advantages designed to encourage families to start saving early. And savings can start before a baby is even born. 1. They have tax incentives. Contributions to a 529 plan can be placed in a variety of investment options, including stock mutual funds, bond mutual funds and money market funds. Beneficiaries won’t have to pay taxes on the earnings accrued by 529 plans as long as they use the money for qualified education expenses, like tuition. Many states also offer tax incentives for contributors. For example, New York’s 529 Direct Plan offers account holders who pay taxes in New York a state income tax deduction of up to $10,000 a year on contributions for married couples filing jointly and a deduction of up to $5,000 for individual state taxpayers, according to NYSaves.org. 2. They’re better baby shower gift ideas for a second or third baby. Veteran parents probably already have a high chair, car seat and baby monitor. But older kids can’t hand down a college savings account. What’s more, growing families facing tight quarters likely have little room for new toys, gear or clothes. Families facing multiple tuition tabs in the future will likely appreciate contributions to a 529 college savings plan even more if they’re already dealing with diaper and daycare costs today. 3. They take away the guesswork for future holidays and birthdays. Those who don’t know the difference between a burp cloth and a Boppy pillow won’t have to decode a gift registry before the shower. And, they’ll never have to brave the toy store during the holiday shopping season as the baby grows. Most 529 plans make it easy to contribute to existing college savings accounts online, which parents can manage after the baby is born. Research from the U.S. Department of Agriculture shows that a middle-income family with a child born in 2013 can expect to spend about $245,340 on food, housing, childcare, education and other child-rearing expenses by the time the child turns 18. And college costs could total that much or more. So, it’s easy for parents to have a hard time believing saving enough money for college is possible. But, it doesn’t have to be if parents have a 529 college savings plan. “The key point about giving a gift to be used for college savings is that the gift [giver] will communicate the importance of the college education and, in a way, force the parents to think about the long-term hopes and dreams they have for their newborn,” said Andrea Feirstein, founder of AKF Consulting Group, which offers advice on 529 plan design and administration. “Moreover, starting to save when a baby is born — even just a small amount of money on a regular basis — forces discipline and maximizes the potential for tax-deferred compounding,” she added. 5. They offer the magic of interest. 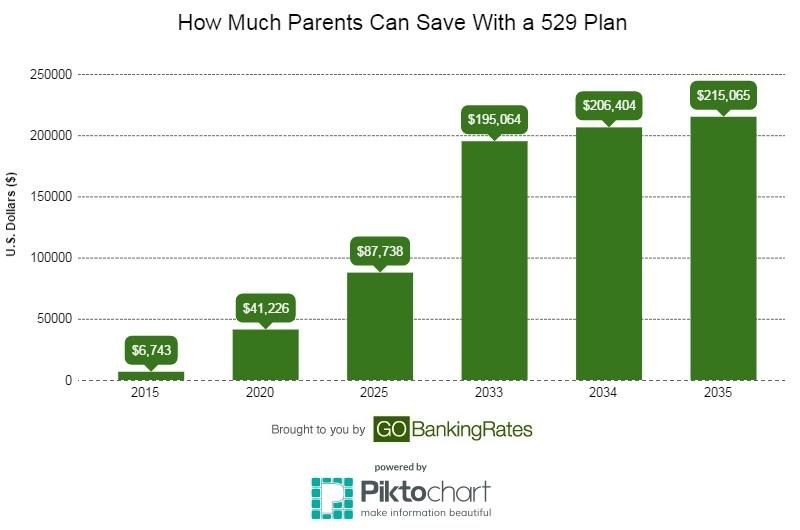 The earlier adults start saving for kids’ college costs with a 529 college savings plan, the more time that money has to grow through investment earnings. By year 2035, your friend would have a total of $215,065 in the 529 plan. However, from 2033 to 2035, college payments totaling more than $50,000 each year would have been subtracted from the account. So by year 2036 — their child’s graduating year — the family would have to pay the remaining amount in the the account: $56,969. By way of comparison, SavingForCollege.com features a Price of Procrastination calculator that quantifies the potential cost of every day and year parents, families and friends wait to start a college savings plan. It assumes an annual investment return of 6 percent from the plan and a 4 percent inflation rate for college costs. The first step toward choosing a 529 college savings plan is reviewing the plans in your (or the beneficiary’s) state. “A [gift giver] might wrap up the enrollment materials for the 529 plan offered by the state in which the baby resides — particularly if there is a state tax benefit associated with an investment in that state’s 529 plan,” said Feirstein. States often offer additional tax benefits for residents who start a college savings plan. They sometimes also offer other perks, such as matching grants, that would not be available by investing in another state’s 529 plan, according to the College Savings Plans Network (CSPN). On the other hand, another state could offer a plan with low fees or other features that appeal to you. The best 529 college savings plans would have fewer and lower fees. CSPN offers online tools that allow you to compare plans by state and features. But if you’re hesitant to start the account yourself, there are ways to give expectant parents some options. Another alternative is a college savings gift card, like those offered by GradSave or Gift of College. These can be used toward a 529 plan or other savings tool, said Feirstein. Once you or the parents-to-be have chosen a 529 account, visit the plan’s website to find out how to fund it and make additional contributions, which you might choose to make through payroll deduction. As just one example, California’s ScholarShare College Savings Plan allows you to start a new account and make the minimum initial contribution of $25. However, you must know the beneficiary’s Social Security number or federal Tax Identification number as well as some other basic information. Subsequent contributions should also be at least $25 unless they are made through automatic payroll deduction, which can currently be as low as $15 per pay period and have the added advantage of encouraging regular investment in the plan. You can contribute as much as $371,000 per beneficiary account as long as the total balance of all accounts for that beneficiary doesn’t exceed $371,000. But accounts that have reached the maximum account balance limit might continue to accrue earnings, according to the California ScholarShare site. Keep reading: How Much Should I Save for My Child’s Education? Even though many families will never reach that $300,000-plus cap, starting a 529 plan early will help their child’s savings — and dreams — grow. Here's what you'd need to afford college tuition in your state.